Zombie Garden Gnomes Lawn Ornaments | Nerd Much? We’re not sure which side of the garden gnomes debate we come down on. Are they creepy, or are they cool? Meh, we’ll never be able to decide. 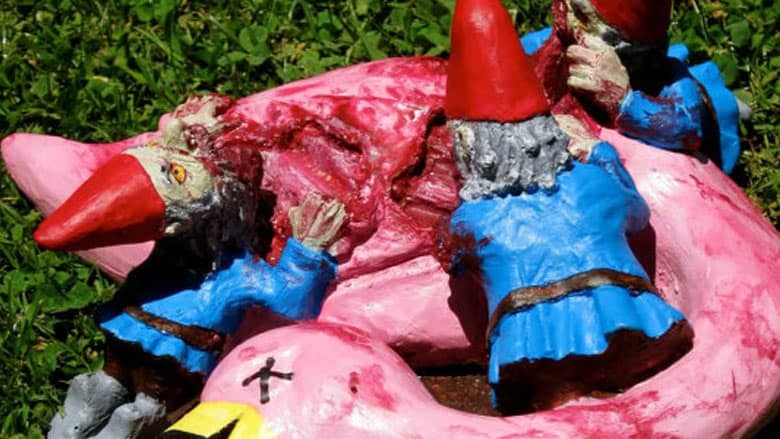 But, it certainly helps that now there are more options than just the plain ole’ run-of-the-mill Travelocity gnomes, like these Zombie Garden Gnomes. A zombies x lawn gnomes hybrid? Count us in. These Zombie Garden Gnomes put a unique spin on the lawn gnome, as it depicts a trio of little undead guys going after a pink flamingo. Now, as far as the pink flamingo lawn ornament is concerned, we think THAT should die a quick death — how tacky! With the Bye Bye Birdie Zombie Gnomes, that flamingo is donezo, as it has been chewed up and now lies in a bloody mess while being eaten by a trio of zombies. While you might not want this on your lawn all year (although, admittedly, a snowy lawn would make this ornament really pop), these are a perfect addition to your Halloween decorations. For more cool stuff to buy on the geek spectrum, stay tuned to Nerd Much.